Shadowrun 5th edition, a new edition of the classic RPG. If you're a frequent reader you'll know it's one of my favourite settings and I'm a massive collector. 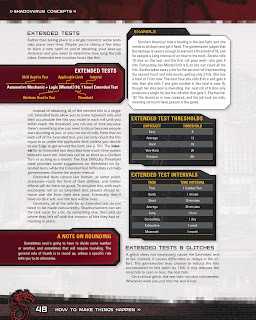 Catalyst were kind enough to give me an advance copy of the PDF so I could review it for you all. So here we are. It's a sizable review, for a sizable book, so I've split this review into two separate posts. This is part 1 and will concern itself with the first half or so of the book. First off it's a big PDF. The copy I have is 489 pages and weighs in at 42.8mb. I've definitely seen larger filesize core rulebooks (Legend of the Five Rings I'm looking in your direction.) However for all it's size this PDF is well designed. It has bookmarks and the pages are very responsive, even on my tablet. Which is great as this is a full colour book. The artwork in the book is mostly new. I noticed some reuse (the header art from the Combat chapter for instance is from the cover of Feral Cities, and a full page shot in the Matrix chapter is the cover of the fourth edition Matrix supplement. The art is mainly full colour though there are a few black and white line drawings through in for variety. From a layout perspective the book is definitely more Shadowrun 20th Anniversary Edition than the relatively plain Shadowrun 4. It is mostly a two column style with consistent looking red bold for major headers and black bold in a smaller font for sub-headers. There is additionally white text on red sidebars and callout boxes. Tabular data is presented cleanly in grey boxes with yellow headers and white text with the rows consistently identified with alternating grey shades just like many spreadsheets. The predominant colour scheme is red, black and white, and it works. I like the layout, it's clean and the text doesn't bleed into the background at any point I noticed. The same background image seems to be used for each white background page, seems to be a cityscape shot of Seattle, and the image is subtle and never interferes with the text. It's mainly there to provide some texture to the pages and works well as a backdrop. The material of the book is split into 11 numbered sections, most preceded by a 4 page short story. The first chapter gives an overview of the Shadowrun world as told by a fellow running set in the present. It covers the Shadowrun world in incredibly broad strokes covering topics such as Where to Run (incredibly brief overview of the entire geopolitical world), day to day life of a runner, analysis of a run, details on money, brief talk on the Matrix and the like. The section is well written but, it has to be said, it feels very short and lacking in any depth. Surprisingly to me, doesn't include any real history. No mention of the Great Ghost Dance, Lone Eagle Incident or the like. It gives brief mention to UGE, date of the Awakening and mentions Dunklezhan was elected president, and then assassinated, but it fails to give real context to these items. I understand that the Shadowrun history has gotten very complex but the exclusion of any real discussion on the Native American uprising resulting in the NAN I'd imagine would leave a new player or GM scratching their head trying to figure how the world works. It's mentioned that Seattle is on its own in a sea of NAN, but no talk as to why. What material is there however is well written. It's not dry and is presented in a pretty good, and sometimes amusing, manner. I guess it's a very brief overview and the setting would be explored more in later books, but it feels that this could have been meatier. 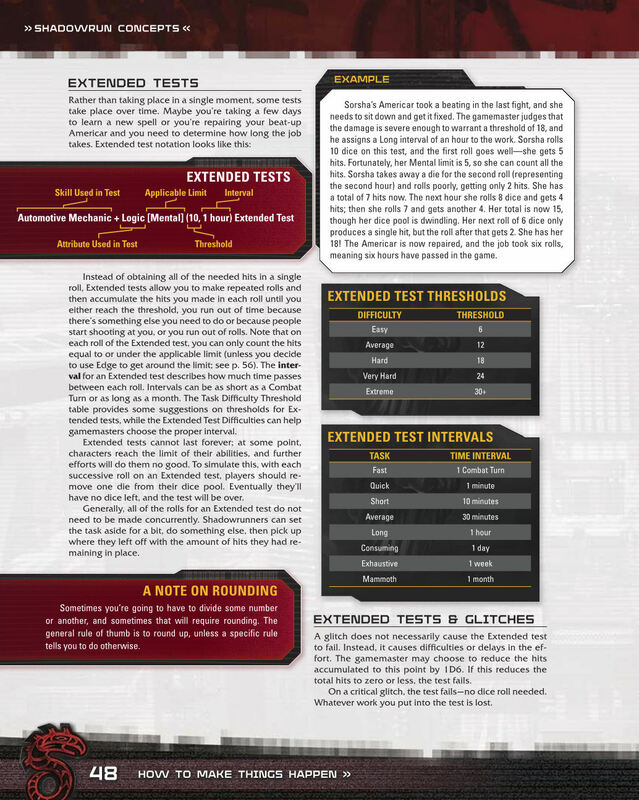 However the game is likely being aimed at people who have more than a passing familiarity with the setting so for a rulebook it's not a great loss, though a couple pages of timeline would have been useful even if they weren't expanded upon. This is the section that gives an overview of the core dice mechanics and introduces you to the character attributes. It isn't a full exploration of the rules, you won't find any details on combat in here, just a concise description of the core mechanic. And that core mechanic has changed a little from the 4th and 20th Anniversary editions. It's still a D6 system with 5 or 6s counted as hits. It's still a threshold based system with X successes needed. Glitches seem to be the same as 4th edition from what I can recall, or at least not changed significantly. What has changed and is new if the concept of Limits. A limit is basically a rule that prevents someone from having too many successes in circumstances where something may limit them. For instance if you're firing a gun you will be limited to the number of successes (hits) you can have based on the accuracy of the weapon you're using. If your cheap gun only has an accuracy of 4, even if you're the best shot in the world you cannot under normal circumstances get more than 4 hits on a shot due to the equipment bring you down. There are ways around these Limits using edge, buying better equipment etc but they do add a limiting factor into the mechanic, possibly to avoid the ridiculous successes that are possible when dice pools get large. They're what stops a weakling elf from benchpressing a Mitsubishi Jackrabbit just because he rolled well. I can understand that some may not like this new mechanic, and I'm sure it would be easy to ignore, but I quite like it. It adds more differences to equipment and characters. The extended tests follow a similar format and the rules for these seem simple and elegant. The mechanic behind this doesn't seem to have changed from 20th Anniversary other than to add the Limit into the equation. Teamwork tests again are similar to SR20A but the successfully helping player also raised the new Limit score by 1 in addition to the extra die they provide. Edge makes a return as well with very similar rules. Again it seems possible for a high Edge character to dominate, especially on the Push the Edge use. This allows them to add their Edge rating into the dice pool, initiate the Rule of Six (which allows each 6 to generate an extra die roll) and ignore all limits. However while it's powerful I suppose a GM could be more discerning on when they allow such a player to regain Edge to prevent them dominating. I'd have to see how it plays out on the table. Generally speaking I like the base rules presented here. The changes from SR20A and 4th are really around the Limits which again some people will love or hate. First off Priority Purchase is back!!!! Yay. 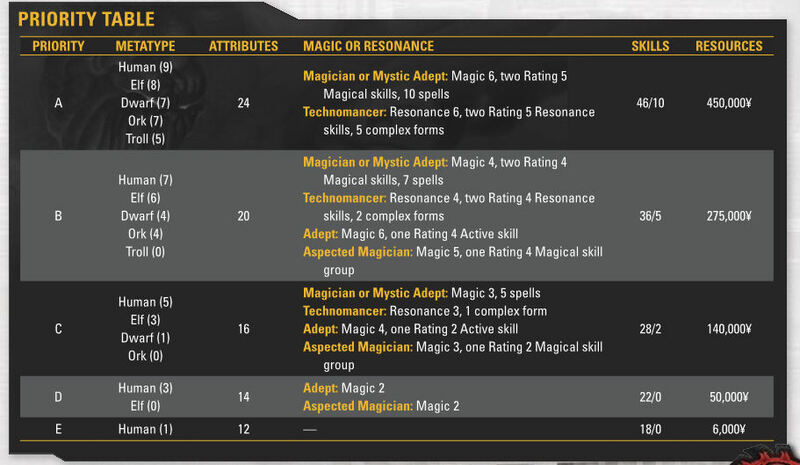 So in Shadowrun 4 and SR20A character generation was a points based system, well now it's gone back to the priority system we all know and love where you assign one of five slots to Race, Attributes, Skills, Magic/Technomancer ability and Resources. I'm going to reproduce the table here because this conversation will be easier (I hope Catalyst don't mind.) It's the same as that in Preview #3. Forgive the size and that it breaks my formatting but it's more important that you see it all. So for priority generation for those who don't know, you allocate a single priority level to each of the five purchases. Some explanation is needed here as it differs from the previous versions in a couple of respects. The number by the Metatype is the number of points you initially have to spend on Special Attributes. Special Attributes are Magic, Resonance and Edge. These points can only be spent on Magic or Resonance if you pick a priority for Magic or Resonance that grants you that in the first place. This actually leads to an interesting situation whereby if someone choose A as priority for a human and didn't want to be a Magician or Technomancer then they end up with more Special Attribute points than they can possibly spend on Edge alone. Edge (basically your luck skill) starts at 2 for humans and can go to 7 (8 with a quality picked later.) This means you can only use 6. Obviously you wouldn't pick that, but you can get into a strange situation if you're not careful. The rest is relatively straightforward if you have any experience of Shadowrun. Attributes are how many points you get to spend on attributes, Skills are how many you get to spend on Skills with the number after the / indicating how many you get to spend on Skill Groups. It's not entirely clear from the text if the number to be spent on Skill Groups comes out of the former number or not, however the character generation examples clear this up. Resources are the amount of nuyen (the cash in Shadowrun) you character gets to buy gear with before the game starts. Magic or Resonance is where you pick if you are going to be a Technomancer (someone who can access the Matrix without any gear just the power of his/her mind) or some flavour of magic user. This splits down into full magician, mystic adept (someone who can cast spells and use magic to enhance their natural abilities), Adept (someone who uses magic to solely enhance their abilities) or Aspected Magician (a magic user who can only use one type of spell from Sorcery, Conjuration or Enchanting.) It's too complex to go into all the magic rules here, but this priority selection allows you to customize how powerful you wish your character to be in their area. So the character generation chapter takes you the whole way through the generation process one step at a time in a relatively logical manner. Having a quick play through it myself I will say that because of the stepped approach, and the return to the priority system, character generation is much more rapid than in 4 or SR20A. It's also much more focused. It's easy to pick qualities from the list in the chapter, determine your stats and follow the examples. Ah the examples. During the character generation chapter you are guided through on each step the character generation of not one but three different characters. A Technomancer, a Street Samurai and a Mystic Adept. Every single step of the process ends with these three characters going through it and showing the results. This makes it much easier to follow than previous character gen examples in almost any game. They even show you the character sheets filled out at the end. The unfortunate thing about the chapter however is there are a few mistakes in the tables and examples. Dwarves have lost thermgraphic vision, some of the examples are missing items either from the text or the resulting tables and the increase in lifestyle and equipment costs for a troll changes between 50 & 100% throughout the chapter. I've picked up from other forums that they are aware of these issues and a day 1 release errata PDF will be available to cover these issues. I'd imagine this PDF will be updated for the core book at some point in the near future. The chapter ends with 16 sample characters that you could just pick from if you liked. These consist of the usual range of Shadowrun archtypes; Street Samurai, Covert Ops Specialist, Occult Investigator, Street Shaman, Combat Mage, Brawling Adept, Weapons Specialist, Face, Tank, Decker, Technomancer, Gunslinger Adept, Drone Rigger, Smuggler, Sprawl Ganger and Bounty Hunter. I must say though, I miss the Burnt Out Mage from previous editions. All in all it's one of the best character generation chapters I've come across in a while in any RPG. There's nothing strange or particularly new in it from previous core rulebooks that I noticed, some qualities have changed (qualities are advantages and disadvantages you can pick) and I do like that having a valid SIN (System Identification Number) is actually considered a negative quality due to the tracking that comes with it. The skills chapter is all about, well, skills. As expected it's mainly a list of all the official skills in the game, what they're used for and more information on each one. It goes into more detail on Skill Groups, using specializations in skills and the substitution system for if you don't have a particular skill you need. There's not much point going into much detail on this chapter, you know what to expect. Useful and highly referencable chapter, but not exactly the world's most exciting prose. It does the job though and the text is clear and not confusing. At first glance the combat system doesn't seem to have changed a huge deal. Combat still starts with a roll of initiative and characters acting in initiative order. At the end of the phase 10 is taken off all the Initiative scores and those with +ve scores left get to go again. Rinse and repeat. Actions in combat are split into Free, Simple and Complex actions with a character getting a free and either two simple or one complex action in each initiative pass. Nothing new to see here. Attacks consist of a roll to hit, a roll to avoid and then a roll for resisting the damage, just like SR20A. I wonder if there is any way to houserule that down to two rolls, one on each side as it feels like one roll too much to me. However this is the way it was previously and it seems to have worked out so I'll defer to those who've managed to play with the 4th and SR20A rulesets. Other than the occasional modifier change and the introduction of limits not a huge amount has been altered as far as the general flow of combat goes. There are obviously some changes though. For burst fire instead of adding 2 damage to the damage dealt bursts reduce the defender's pool by 2 dice to avoid the attack. Related to the recoil, semi-automatic weapons can only fire once in an action phase. In SR20A they could be fired twice, one for each possible simple action. As a result though SA weapons don't build recoil over time. Also speaking of grenades the "chunky salsa" effect, a grenade going off in tight confines, appears to have been increased considerably. This is due to the fact that grenade damage has been dialled up in general considerably. In SR20A a Frag grenade did 12P damage, in 5th it's 18P. If someone shoots at you you have two choices. You choose to just take it and get a Reaction + Intuition roll to try and avoid it (unless you couldn't see it coming) or you can take the option of taking a Full Defense. Full Defense however has changed considerably from SR20A rules. In SR20A Full Defense was a complex action you could take if you were expecting to get shot at, and that was your action. In SR5 it's more reactionary. You can choose Full Defense at any point in the round as long as you still have an action to come. Under Full Defense you roll Reaction + Intuition + Willpower as your defense roll (bonus of Willpower.) You also get the Willpower bonus for the rest of the round. The cost, you immediately lose 10 points off your initiative. The effect of this is you don't always have to anticipate the need for a Full Defense, but you'll forgo some of your later actions as a result of the reduced initiative. One big change in the combat chapter however is examples. Yes there were examples in previous editions, but not to the extent that there is in SR5. In fact for the entire book their use of examples is fabulous. Almost every significant rule in the combat chapter either has its own example or is involved in one of the examples. I cannot stress enough how much of an improvement these are. While much of the actual rules text in the combat chapter is copy and paste from SR20A with some alterations, the examples are where you're happy they spent the extra effort in clarification. Overall I like how combat is structured and it seems that after a few tries it should flow relatively smoothly. If you've played SR4 and SR20A it seems it will run more or less the same, just a few minor tweaks. Are they good tweaks? My instinct says yes, but as always not everyone will agree on that one. So that ends part I of my 5th edition review. Come back for Part II shortly. EDIT: Part II can be found here. Thank you for these photos, I really liked them. The best written service in the USA- essay helper online .